Panasonic has announced a new solar module prototype that has set a new world record. The Japanese electronics giant has revealed only days after U.S. green energy company SolarCity announced that its forthcoming rooftop solar panels will be the most efficient in the world, that it has produced a new solar module prototype based on mass-production technology, that is even more efficient than SolarCity’s panels. Both companies have created new records for solar energy panel efficiency. Last Friday, SolarCity announced that it had made a breakthrough in solar panel technology and would be creating high efficiency and low-cost solar panels. The panels have a module efficiency of 22.04%. This is a measurement that refers to the amount of energy the panel can generate. While this may not sound like much, for the solar industry it’s a breakthrough considering the size and affordability of a product that is designed for a roof. The top performance of the average solar panel is typically anywhere from 15 to 17%, but SolarCity says that its new panels with improved efficiency can produce between 30 to 40% more power than their competitor’s panels of equal size. 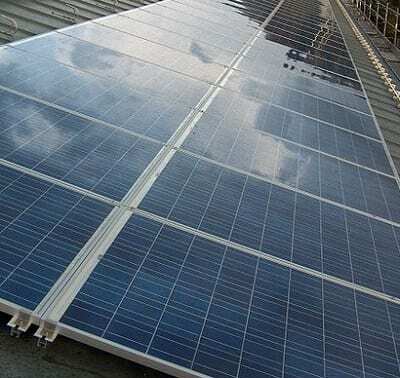 However, Panasonic announced yesterday that is has created a 22.5% efficient commercial-sized solar module based on mass-production technology. This advancement made by the company means that it has surpassed SolarCity in having produced a solar panel with the highest efficiency in the world. Panasonic’s solar panels are not the same as SolarCity’s models. Even though it seems that Panasonic has successfully stolen SolarCity’s thunder for the time being, it should be noted that Panasonic’s solar panels are based on “thin-layer” solar cells. The reason this is worth noting is that these solar cells are more expensive to produce than the standard cells being used by SolarCity. Therefore, at the moment, even if Panasonic’s panels are more efficient, they are not as cost-effective. Panasonic has not yet revealed a specific date for when its panels would be used commercially. SolarCity, on the other hand, said that it will produce its new high-efficiency panels at its major solar panel factory that it is building in Buffalo, New York. The factory, which will also be North America’s largest solar energy panel manufacturing facility, is expected to produce anywhere from 9,000 to 10,000 panels daily and is set to open in 2017.